A touch of blush is the easiest way to look pretty, fresh and radiant. Unfortunately, it’s also the easiest way of looking like a 2-year-old took to your face with crayons and water colors. So, here’s the professional take on how to be the former rather than the latter… broken down into small, easily do-able chunks. Because sometimes even the celebs get it all wrong! People tend to think brighter blush looks better, but that’s untrue. Blush should look believable and not obvious, unlike eyeshadows or lip colors that can be dramatic. When it comes to cheek colors, stick to what looks like it’s your own color coming through. And easy way to pick a shade: do it immediately after a workout (or just walk to the shops) – your ideal shade is the one closest to the flush of your cheeks after exercising. The darker your skin, the deeper the shade… that way it’ll show up. Darker skin with a blush that’s too light will make you look sallow. And save shimmer-flecked powder blush for evening: in daylight it’ll look fake and the shimmer will make your skin look dry and bumpy. Instead, opt for really fine, silky formulas. Use a large, fluffy brush to apply – I prefer to use a big dome-shaped brush to spread color sheerly so you can gradually build intensity, as opposed to going with full-on bright circles at once. Laura Mercier really makes the best brush: it’s not too big, so you still have control, and not too small where colors look blotchy. 3. I should put it where? 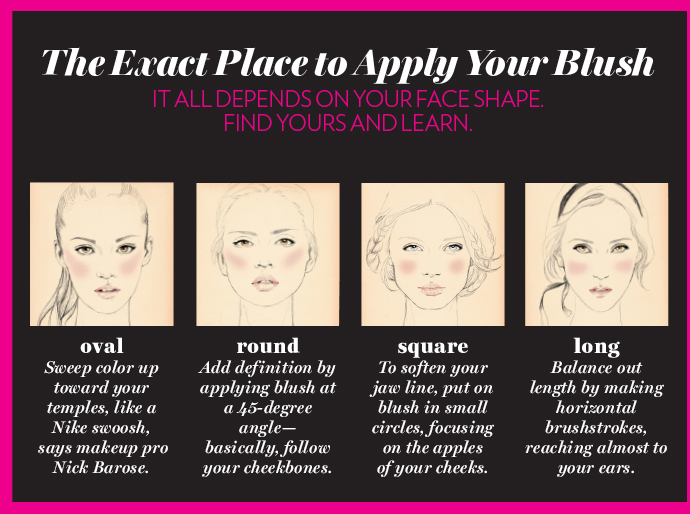 Where you put blusher will depend on the shape of your face and there is no one rule that works for everyone. A “safe” place is to apply it from under the cheekbone to the top, following the natural shape of the bone structure. But you have to be wary: on a very long face, this will further elongate the length. The same goes for someone with a very pronounced jaw line. Glamour USA did a phenomenal “face chart” that makes it much easier to pick the right spot. Lightly sweep a domed make-up brush through the blush and tap off any excess. Then gently dust the blush onto the apples of your cheeks. Then blend, blend, blend – especially around the edges so you don’t see circles or stripes. When you’re done brushing on your blush, blend around the edges with a sponge or puff (a regular wedge-shaped foundation sponge works just fine). Blending it down this way makes the color even sheerer and more believable looking. This is optional but really terrific at adding depth and glow to the overall effect: apply a powder highlighter on your cheek bones to complement the blush. Then, using a fluffy brush , blend the blush and the highlighter together. What are some of YOUR tricks for getting blush just right? Tell us below! « 10 seriously wacky beauty products you should (and shouldn’t) try! Also, if you want to go for a naturally blushed look staying in the pink to peach area works better than reds, because you want to look healthily glowing, not embarassed. (I had a friend, who always wore two red spots on her cheeks so I first thought she was always nervous.) And if you tan in summer or lose colour in winter, adjust your blush colour every few months. so what did you buy? tell! tell! Just wish that chart had a heart shaped face option. I’m stuck trying to find the right combination of the round and the long shaped face diagram without looking ridiculous lol. Still an awesome article though, I am definitely signing up for new post alerts! I started one article three hours ago and now I can’t stop!